So here's a short review of a book I bought in 1996 and never got around reading. It dutifully followed me around from address to address, never to be taken from the shelf I put it on, except to be packed once again. Until the early summer of 2018. There were two reasons for doing that: 1) In my review of the Roger Waters show I referenced R.E.M. and 2) for some reason, I can't recall, I wanted to find out how 'Radio Free Europe' sounds like, as I always hear about the that song and have never, consciously at least, heard it. And then I remembered I had this book and tried to find it. R.E.M. has never been my favourite band. In the 80s I heard about this band that was supposed to be the new The Byrds or the new Tom Petty. Both not the kind of endorsement that invited me to listen to its music. I had a tape with a live show from somewhere in the 80s that did not convince me. Two cassette tapes from around 1990 with copies of albums, I think 'Document' and Green', that I never found a reason for playing really. My musical taste was in limbo in the late 80s. Stuck between what had been and what I did not like in the 80s. And then came 'Losing My Religion' and from there onwards I tried to get into R.E.M. and was sorry to hear of Buck-Mills-Stype putting the band to pasture as I liked the band better per album ever since. Its 80s output still went by the song. I never truly found a reason to reach back right up to this day. That may change now I've listened to 'Murmur' with my 2018 ears. When the band quit, several years back, it did so with an album I can't even recall the title of, but that showed a band in great shape and form, that could have grown old gracefully, but decided not to. Independent thinkers as they were (probably are) as I found out by reading this biography, they chose to call it quits while they were still artistically winning. This book, originally titled, 'REM-documental', follows the band from its first steps in the alternative 1980 scene of Athens right up the release of 'Monster' in 1994. Dutifully the authors follow the band forward in time per album. There's no true depth, hardly any explaining, just the words of the various band members and people around the band culled from interviews in English language music magazines, mostly from the U.K. as well. An aptly chosen title it seems, 'Documental'. A few things truly stand out. The choices the band made career-wise, were not the easiest to make. R.E.M. became bigger by the album, allowing the band to mature fairly naturally, through the hardships and the slow growth towards bigger and lusher pastures. Control is an important word in the career of the band. True control and no compromises are impossible for every person in life, but this band tried hard to have it over its own career. It came a long way, I learned. Yes, there's a lot mystique involved around the lyrics and the consciously subdued vocals of Michael Stype adding to the mystery of what he truly is singing. As anyone can see, the titles to songs are often sort of incomprehensible. 'Swan Swan H'? You tell me and that's just one example. R.E.M. has a clear vision of its music and where it wants to go with that music. Political messages are all over the place and that somehow stuck with me, the none fan, as I think it's time for R.E.M. to step back on stages and telling the world what's happening right here and now. Finally, what surprised me is that the band more or less gave up on Europe while under contract to IRS, Miles Copeland's label. R.E.M. was a huge underground name over here in the 80s. They never could have become that if the records did not reach the right people. So what's the true story Mrs. Bowler and Dray? This part truly surprised me, as finding a distribution channel isn't an impossibility, even for an U.S. based independent label in the 80s. 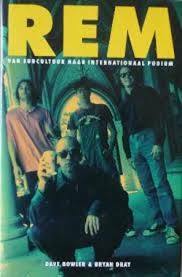 As most biographies, R.E.M. 's reads like a page turner. Am I truly learning something? Of course a few things, about the start of the band, producers they worked with and why, but in the end not really enough. For that this book is too light weight. There's not much in there had I been a fan and following the band from an early stage. So for now certainly enough and like I wrote: this is a good read. Perhaps this combination comes with the publisher? In Dutch the book in 2018 is only available in second hand stores. The publisher, the Free Record Shop, is out of existence for years also. One the many chain stores that went under with the advent of the Internet and illegal downloading in particular. Also a far to shallow record store. I hardly ever went there to buy anything really as it hardly had records I was looking for. Discount DVDs, yes. And somehow this book it seems.